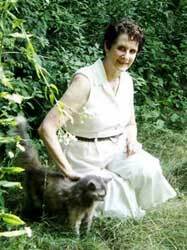 Today we have Joan Szechtman, author of two books about King Richard III in the 21st century. Joan, please tell us about your latest book. JS: First, I want to thank you for this opportunity to share my books with your readers. I currently have the first two books of a trilogy about Richard III in the 21st-century published—the third is still a work in progress. It will probably be easier to tell you about both published books than just the second, since the themes are connected. However, they can be read as standalone novels, because, for one, there are no cliffhangers from the first book to the second. THIS TIME starts moments before Richard III loses to Henry Tudor on the field of Redemore near Leicester, England on August 22, 1485. In THIS TIME, a team of Ricardians substitutes an armor-clad corpse for the king and brings him into Portland, Oregon. Richard awakens August 21, 2004 to an alien world where even the English he speaks is different. 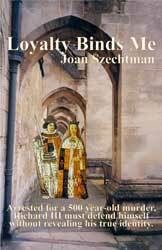 The second book, LOYALTY BINDS ME, continues Richard III's story. Richard has married a divorcee, adopted her two daughters, and with the help of his new wife, has been able to rescue his son Edward, who had predeceased him in the 15th-century. Richard has lived in the 21st- century for two years, and his son has been with him for the past year. At the start of the novel, they have just arrived in London, when Richard is brought in by the Metropolitan Police for questioning about the alleged murder of Richard III's nephews in 1483. Richard must now find a way to clear his name and protect his family while concealing his true identity. Rachelle: This is a twist in time travel since most travelers go back in time, but you chose to bring a character from the past to today. Why did you decide to write about Richard III and why not a straight Historical Fiction? JS: In 2004, my mom recommended I read THE SUNNE IN SPLENDOUR by Sharon Kay Penman—a historical fiction about the life of Richard III. Even though the book was nearly a 1000 pages, I couldn’t bear to put it down. Her Richard was so different from the Shakespearean arch-villain I loved to hate, that I had to learn more. I was hooked and Richard refused to let go of my imagination. The more I learned, the more I felt compelled to write about this maligned king. But I wanted to look at Richard from modern eyes and not try to create a poor copy of Penman’s masterpiece. So, being a SciFi nut and more and more hearing Richard in my mind, I decided the best thing to do was to have a virtual chat with him. The chat expanded from what might have been an article or short story, to three novels. Rachelle: I completely understand the sentiment, to look on the other side of a story for a character frequently maligned in history books. What were some of the things that impressed you about Richard III to make you want to set the story straight? JS: Throughout his life, Richard was known as a fair arbiter. In his capacity as a judge in civil and criminal cases, he often found in favor of the commoner over the nobility when the evidence supported the commoner’s case. His practice of blind justice was in contrast to the norm of the day. One of his first decrees as king was to reform bail, juror qualifications and that one could not be held without charge (people were often held for months and years without charge, having to effectively pay a ransom to gain their freedom). He wrote, “The law shall cease to be an instrument of oppression and extortion.” He also established councils in London and in the north where a commoner could seek redress through the king’s proxy. Rachelle: This all makes him a sympathetic character. Please share something with our readers from your books. The following snippet is from the second book, LOYALTY BINDS ME, where at the start of the book, Richard is arrested for the murders of the princes in the Tower. He took the name Richard Gloucestre in the first book. In this scene, Mortimer, the officer in charge of the cold case division that is looking into the murders of Edward IV’s sons, is waiting in a pub to speak to a solicitor. On the previous day, he had interviewed Richard about the princes. Mortimer had just gone to the National Portrait Gallery and viewed Richard III’s portrait and had bought a postcard of the portrait in order to study it. Mortimer took another pull at his stout and traced his finger over the postcard's image—forehead, cheek, and chin. There was enough resemblance to the portrait that if Richard Gloucestre were standing next to it, a passerby might think they were related. The features in the portrait were coarser and more pronounced. The man he'd met had wider cheekbones and a shorter chin than the image. The most striking difference was the appearance of age. Gloucestre appeared to be in his mid-thirties, agreeing with the age on his passport—thirty-four—whereas the portrait gave the impression of a man ten years older, yet Richard III was killed in battle at age thirty-two. For Mortimer, the most disturbing feature of the portrait was the eyes. Somehow, the artist had captured the intelligence behind the dark gray eyes in that posthumous painting. These were Richard’s eyes. And if you could see a man’s soul in his eyes, then the man Mortimer had interviewed the previous day had Richard III’s soul, if not his body. Rachelle: Great excerpts and character studies. What kind of books do you like to read? Which authors influenced you? JS: While I won’t rule out most genres, in fiction, my favorites are (in no particular order) humor, science fiction, literary, historical fiction, mystery, and combinations of genres. In non-fiction, it would have to be books on science and technology, and lately history because of my newfound interest in Richard III. Some authors who’ve influenced me are Sharon Kay Penman, Paul Murray Kendall, Annette Carson, Mark Twain, James Thurber, Joseph Heller, Ken Kesey, Vladimir Nabokov, Charlotte Bronte, Charles Dickons, Louisa May Alcott, Harriet Beecher Stowe, Herman Wouk, Rachel Carson, Isaac Asimov, Arthur C. Clark, Lois McMasters Bujold, Ursula Le Guin, Gerald Weinberg, Pohl Anderson, Janet Evanovich, Richard Feynman,...to name a few. Rachelle: That's quite a list! Are you a character driven or plot driven writer? JS: I’m a character driven reader, so while my books have plot, the characters are more important for me. In fact, I ended up discarding about 30,000 words of my first book because Richard refused to do what I had initially set out for him to do. Metaphorically, he told me where he wanted to go and how I should get him there. Far be it from me to disobey the King of England. Rachelle: Ha, ha, of course. You're his loyal subject. Do you have any advice for writers who are just starting out? JS: First—write! Then find a critique group. I found a fantastic online workshop, Critique Circle. I would encourage any new writer, as I was, to find a critique group, either online, or if you’re fortunate enough to find people locally, in person. The online group has the advantage of being able to participate when you have time—local groups are unlikely to be willing to work with you at 3 am if this happens to be the time you can submit questions and/or work for critiquing. Grow a thick skin and seek out criticism. This is what will hone your craft. Join a group that has a focused interest in the subject on which your book is based. For example, I joined the Richard III Society so that I could learn more about Richard III and make contacts that could help me vet my assumptions and speculations to the extent that it wasn’t impossible for xyz to have happened. Then when you think your baby is ready to publish, find a freelance editor to go through the entire manuscript. Everyone needs an editor. Rachelle: What is one thing you wish you knew before you began this journey? JS: How to market my book. I’m still stumbling around. Rachelle: Did you dream of being a writer or something else? JS: Ever since I can remember, I wanted to be an engineer, with side trips to veterinarian, botanist, and doctor. But I always came back to engineering and got a degree in Electrical Engineering. After a brief stint working with hardware, I then spent the next 40 or so years in computers and network technology. It wasn’t until I retired and found Richard that I gave any thought to writing. So if I can do it, anyone who wants to write can do it—especially today with access to information and groups that was unheard of when I began my first career. Rachelle: That is very inspiring and all made possible by the online communities we work with. Thanks Joan, for chatting with us. Where can readers find out more about you and your books? Thank you, Cherie. I hope I piqued your interest in Richard III. Richard was no doubt maligned because he was a fair arbiter (: Fascinating. This is a very interesting interview. I'm now even more keen to read Joan's spin on this English king. I do think that his "blind justice" had a hand in his losing support among the peers of the realm, his reputation suffered most posthumously. Like politicians today, Tudor demonized Richard to elevate his own status. Great interview, Clare and Joan. 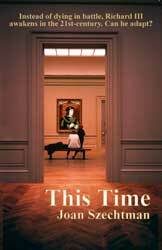 This Time is on my to-read list! Holy cow, Joan! What an interesting concept for a book. I'm a time travel nut myself. Must check it out. Thank you Jeri. Looking forward to your comments.